How often have you and your colleagues completed a SWOT Analysis (strengths, weaknesses, opportunities and threats) and asked, “So what?” What did you actually do with it? Too often SWOT Analysis become a “check-the-box”; exercise, adding little or no value to your business planning efforts. 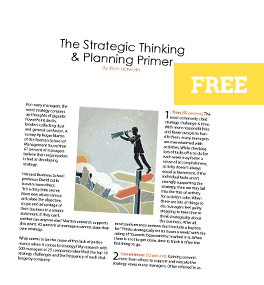 I’ve created a sequence of three steps to go from SWOT Analysis to strategy. Step 1 is the SWOT Analysis. Step 2 is to use the Opportunity and Threat Matrices to prioritize the opportunities and threats based on probability and impact. This is a more objective way for a group to determine which opportunities and threats are most deserving of resources. Step 3 consists of SWOT Alignment where you align strengths and weaknesses with opportunities and threats to develop potential strategies. By combining your internal capabilities (strengths and weaknesses) with your external possibilities (opportunities and threats), you build a more solid foundation for potential strategies. SWOT can be a powerful tool when used correctly and can be a time sucking, snooze-fest when used incorrectly. How well does your group use it?